WARMINSTER, Pa., August 29, 2018 – Wild Styles Children’s Hair Salon has completed the process of becoming a Certified Autism Center, which is a designation that demonstrates the organization’s commitment to ensuring their clients who have autism or sensory sensitivities will have the best possible experience. This is the first organization of its kind to earn the CAC designation. Wild Styles’ staff have served many children on the spectrum over the last two and a half years, but they formalized their commitment to serving those clients by completing the CAC program, which includes evidence-based staff training, through the International Board of Credentialing and Continuing Education Standards (IBCCES). 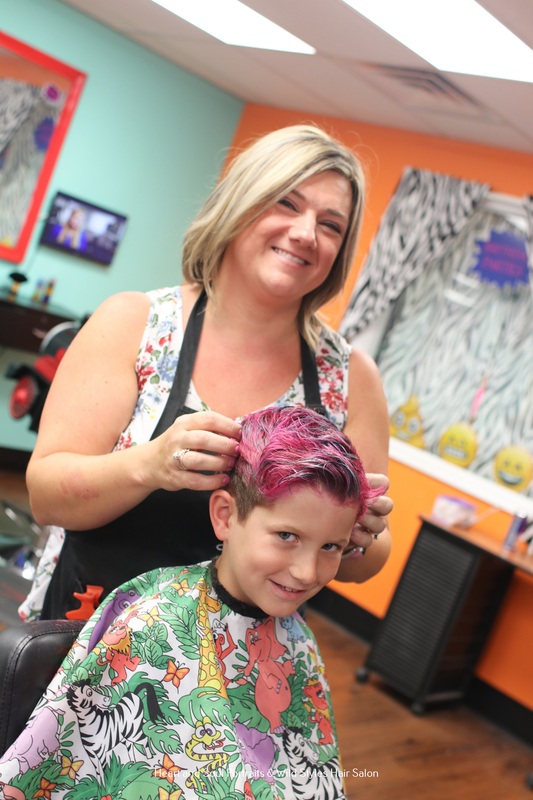 As a Certified Autism Center, parents can rest assured the staff and stylists at Wild Styles are prepared to welcome everyone, regardless of their needs. “It has been so rewarding to watch children who used to struggle with their haircuts, come to us and feel comfortable. This just solidifies our passion for helping these children and their families through the whole haircut experience,” said Brinn Johnston, salon owner. It has been so rewarding to watch children who used to struggle with their haircuts, come to us and feel comfortable. This just solidifies our passion for helping these children and their families through the whole haircut experience. In addition to the CAC training and certification, Wild Styles offers quieter salon times, a private back room, a sensory bucket for distractions, a Velcro board, social storybook, a weighted blanket, and more. For almost 20 years, IBCCES has been the industry leader in autism training for healthcare, education and corporate professionals around the globe. IBCCES recognized that many families with children with special needs have options and created programs specifically for those industries. In recent years, the popularity of “autism-friendly” options has grown; however, parents and families often seek out organizations that have completed additional research-based training or certification to ensure their needs can be met. “Our Certified Autism Center designation is awarded to organizations around the world who have gone above and beyond to ensure their guests have the best experience possible. We work with companies of all sizes and industries – we’re proud that Wild Styles is a leader in their field and will continue to help so many families and kids have a positive experience. Training and certification are so important to make sure these families’ needs are met,” said Myron Pincomb, IBCCES Board Chairman. Wild Styles Children’s Hair Salon is a “wild” place to bring your children for their hair cuts. As soon as you walk into our salon, the fun begins! Our salon offers a vibrant atmosphere. Our waiting room offers toys and games for your little ones. We have cars, trains, or animals to sit in as well as TV’s to watch and video games to play. We specialize in children 0-18. We cater to even the most nervous of children to help make their experience a pleasant one. At Wild Styles, we understand how special it is to get your child’s hair cut for the first time. We offer a first hair haircut certificate along with a lock of their hair for you to keep. We also capture the memory with a picture for you to take home. We also specialize in make-over birthday party parties! IBCCES provides a series of certifications that empower professionals to be leaders in their field and improve the outcomes for the individuals they serve. These programs are recognized around the world as the leading benchmark for training and certification in the areas of autism and other cognitive disorders. As part of our commitment to sharing the latest innovations and research, IBCCEs also hosts the International Symposium on Cognitive Research and Disorders to create a forum for collaboration among industry stakeholders.